When Stanley Morency was 5, his mother gave him her clothes dryer. He laughs when he tells the story. “She’s probably the one who got me interested in electronics. Our dryer broke, and she said I could have it. I took it apart, took the drum completely out. We put pillows inside it, and we rolled down the hill in the drum. This fascination with how things work led him to the electronics program at McMinn County High School in Athens, Tenn. After instructor Carl Creasman brought up SkillsUSA’s Computer Maintenance competition, Morency went on to win the state contest and place 18th at nationals. Not bad for a student who’d never taken a computer class. But as one of seven children, Morency had learned that if you don’t like what everyone else is doing, you’d better have a good imagination and be able to play by yourself. He didn’t watch TV, so there was time to learn new things. 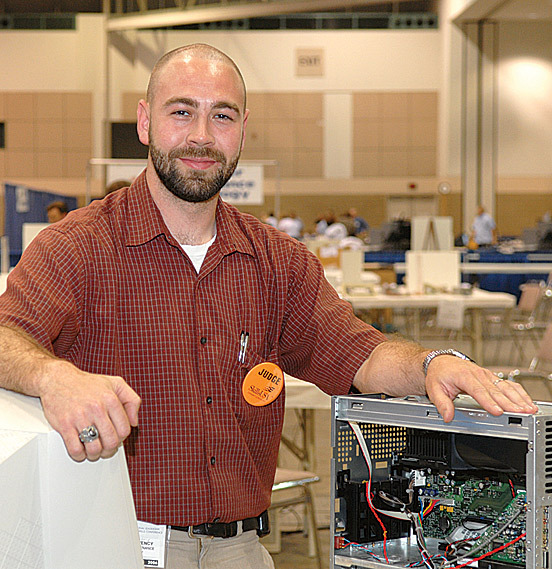 Just months before the state contest, he honed his skills on an off-brand machine bought from a computer-shopper magazine. Morency says he quickly learned its workings by “playing around with it.” He “devoured” information on electronic bulletin board services and in books from the library and from relatives. In 2003, Creasman, who’d become Tennessee’s college/postsecondary SkillsUSA director, recruited him to be a state contest judge, and that’s lead to Morency judging at nationals as well. Morency is finishing his master’s degree in business administration but hasn’t made long-term goals. There’s no shortage of things to interest him. “I like playing with new stuff, and there’s always new stuff and employers looking for people to keep up with it,” he explains.